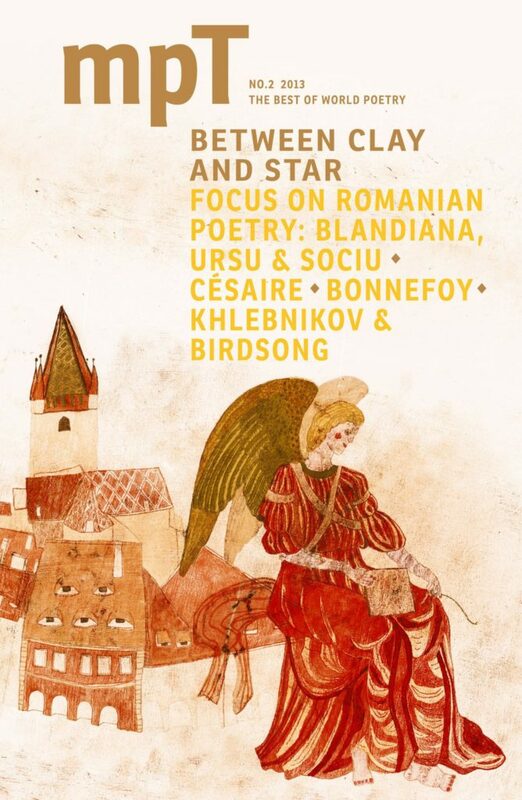 Between Clay and Star is the second issue of the new-format MPT. It offers the usual extraordinary variety of voices, cultures and languages in a neat, portable and beautifully designed magazine. This Summer’s MPT includes a feature on Romanian poetry. Four important poets, whose work spans the twentieth and twenty-first century, Ana Blandiana, Gellu Naum, Dan Sociu and Liliana Ursu, are all represented in fine new translations. Poets Mihaela Moscaliuc, Oana Sanziana Marian, Stephen Watts and Claudiu Komartin are amongst the translators. In our regular conversation slot Dan Sociu and Oana Sanziana Marian discuss hipsters and hippies; online Romanian literature journals and the passions they inspire; and why poets write novels. This issue also features a number of important longer poems by Aimé Césaire, Velimir Khlebnikov and a stately cycle of ‘Preludes and Fugues’ by the French contemporary poet Emmanuel Moses: ‘slow reading’ for the slowest season of the year.